Lisa E Design Blog: TIPsy Tuesday - Inspiration TV? Where do you get inspiration for your cards and scrapbook pages? I love to browse blogs, on-line galleries such as Two Peas and Splitcoast, and scrapbooking magazines. There are oodles of challenges to get us going on our cards and pages, too. There are also many non-papercraft related ways to get inspiration. Most any magazine with its staff of professional graphic designers can be inspiring. I still mourn the loss of House and Garden which had the best photographers. Another place to get inspired is television. Yes, when you are unwinding with the Housewives or watching a favorite comedy, look at the set or the clothes. There are some cool ideas just waiting for you to turn them into cards. Since the first time I watched Modern Family (ABC, Wed. 9:00 p.m. ET), I've wanted to lift the color scheme from Claire and Phil's living room for a card. Their walls are a perfect match to Bordering Blue. The draperies and pillows are a deep orange with a hint of saffron. Finally, on Sunday I made the card above using those colors and I love it! It is a departure from my typical colors and look. So I actively looked on Sunday when we watched the Housewives for inspiration and found it at Bob and Lee's home - the two most wasted talents on that show (but that is another matter). They have some framed pictures in their living room that inspired this simple card. I was going more for style but ended up with a great color combo. 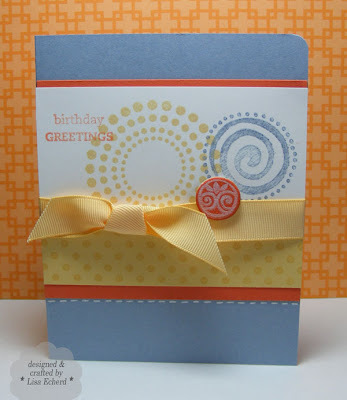 Rarely do I use Creamy Caramel, yet I really like it as the background for this simple, more masculine card. 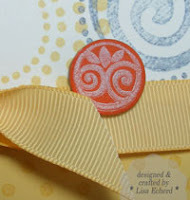 I'm low on orange buttons so I sponged Only Orange craft ink on a small round piece of chipboard and then stamped an image with Whisper White for the embellishment of the top card. 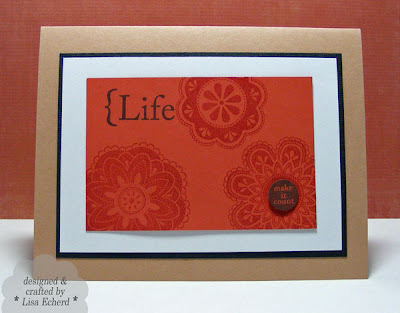 For the "Life" card, I wanted to emphsize the tone-on-tone flowers so they are stamped in a red color on the orange background. I wanted the words to show but not take over so I stamped them in Basic Gray rather than black. Colors will definitely change when stamped on a colored cardstock. So tune in - in more ways than one - to your favorite shows looking for style, form and colors you can employ in your crafting. Life card: Stamps: Fabulous Flowers from Hampton Art; Make it Count from SU!